Puerto Madryn- Whales and Penguins and Orcas, Oh My! So we survived the bus- yey! This was helped (or un-helped!) by a series of Spanish films and music video DJ mixes entitled “I Love Latinos” and “1980´s Love Tunes”…the later sadly I discovered I knew most of the words too, and 16 hours in started singing along to Chris De Burgh, Whitney and Bryan Adams etc! I think I might have been getting a bit delirious at that point! We also caught the attention of a sniffer dog at one of the Argentian Police check points and had our bags checked…but other than that we arrived in Puerto Madryn un-scathed! So what to saw about Puerto Madryn…Its nothing pretty to look at but its the base for travellers wanting to investigate the “nature” and “animal behaviour” and “natural interactions” (how the locals describe it) that surround the Peninsula. And that’s exactly what we did! We spent the day at PeninsulaValdes which is about an hour and half north of the town. 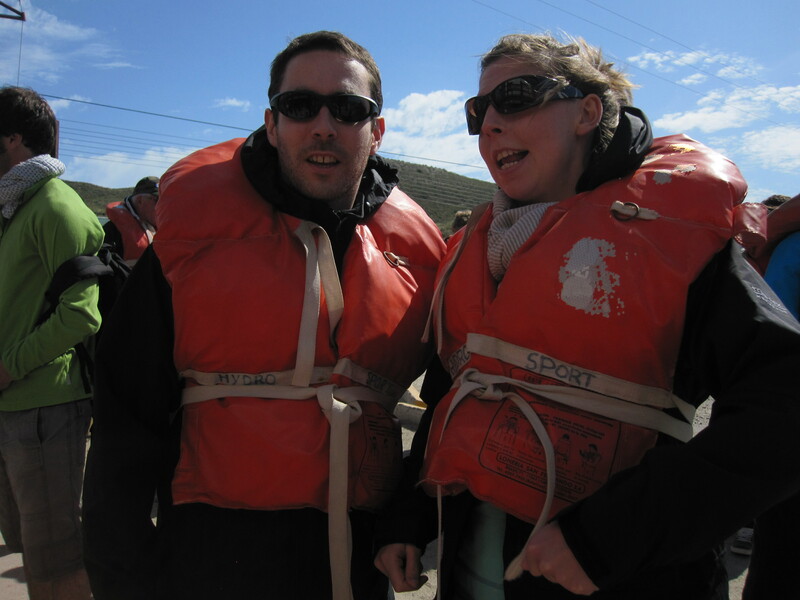 First stop was Puerto Piramides where we went on a boat trip to find the Southern Right Whales. And we saw loads! They come to the bay to breed and also a year later to give birth so there were lots of Mothers and their calves. We saw them dive and jump and they got really close to the boat. And these whales are BIG really big. We also saw an albino white whale which is quite unusual and the boat’s crew got very excited at this point and started speaking very fast in Spanish so it must have been a good spot! We then went to Punta Cantor where we saw the elephant seals. The males are 6 times as large as the females and have squashed and raised noses like an elephant. After the whale encounter these seals were pretty dull! They lie about and only move very infrequently. However our patience with the seals paid off when 6 Orcas came into the shore to hunt the seals which was pretty amazing to see. All the orcas attempt to catch a seal failed which is surprising as they are massive and slow, but hey I´m not gonna criticise old Free Willie! We later was told that there is only 41 orcas in the whole coast of Argentina so we were really lucky to see them. Another highlight for me was seeing the Penguins. We didn´t see many but the ones we did see were super cute and my attempts to persuade Hedd that of course it would be okay to nick one and put it in my bag you´ll be surprised to hear failed! Yesterday we decided to have a “lie in” which turned out to be me getting up earlier than normal at 7am and reading with my head torch…ahh best laid plans! We also went on a massive 20k trek along the coast. We caught a taxi to 4 bays south of Puerto Madryn and then made our way back along the bays. It was tough going at times and extremely hot and I, as always, was inappropriately dressed for the weather and now sporting a rather rosie chest! Factor 50 from now on for sure. But the landscape was cool…kinda like Tenerife´s shore line with tall white arid cliffs and pebbly beaches. There was also white rock around the headlands which looks from the pictures like we are walking on the moon! We spent some time at one of the bays called Punto Loma where they is a permanent colony of sea lions. Now these animals were funny, they huddled together and were really noisy! They made a sound which was a cross between a sheep baa´íng and a person burping! After 5 1/2 hours of walking we were damn pleased to get back to our hostel, collapse in the deck chairs and drink ice cold Coke! This was quickly replaced by a glass of vino blanco and we cooked a steak in good Argentinean style! Off to Gaiman this lunch time to get our fill of Welsh Patagonia culture. Hedd´s been conversing with our next hostel manager in Welsh so, not knowing either Spanish or Welsh I imagine I will be perfecting my “smile and nod” action over the next couple of days! Breakfast, lunch and dinner= CAKE! My particular favourite is the strawberry jam tart! Lessons learnt= As Baz Lurman says “Wear (more) sunscreen”! Whales are magnificent creatures, up until the moment they showed up I was convinced that the trip was too touristy and was a waste of money. 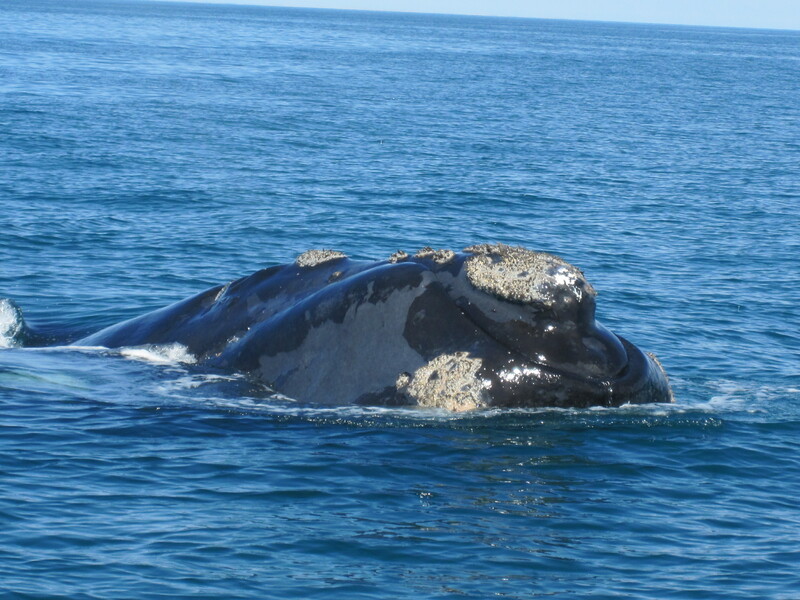 However the moment the Southern Right Whales showed up, you forgot all about the other tourists and just focused on these massive creatures, they were huge. It was a real shame to learn that their northern cousins the Northern Right Whales have been hunted to the brink of extinction and will disappear in the next few years…and that is a real shame.